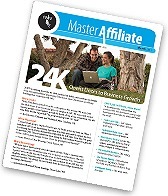 By now, you’ve probably noticed that the Master Affiliate newsletter has a new look! What do you think? new content – and more of it! To view and print the March issue of Master Affiliate, click here. Tell us what you think of the changes! Share your comments right here on the Business Builders Blog.